The Tuti-Nama (Tales of a parrot) is a collection of fifty-two fables compiled by the Persian writer Ziya'ud-din Nakshabi in the fourteenth century. In this popular work the parrot recounts diverting tales to his mistress in order to prevent her from being unfaithful to her absent husband. 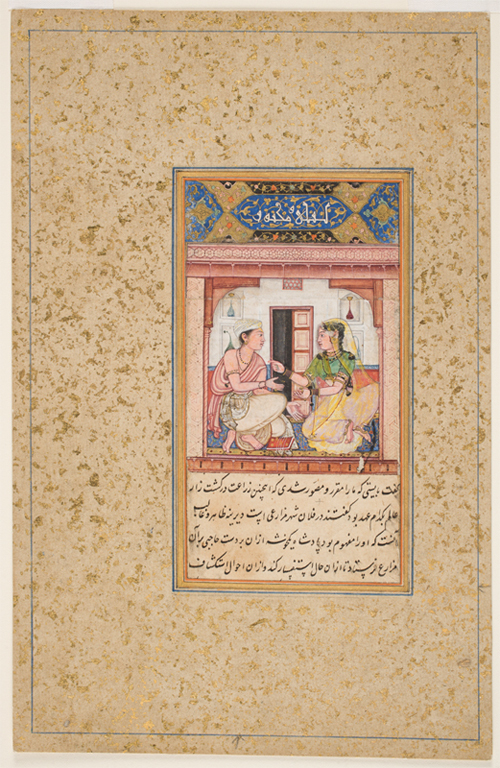 The tales must have been a favorite of the Mughal emperor Akbar, as two lavishly illustrated copies were produced during his reign. The page shown here once belonged to the second of these manuscripts (housed in the Chester Beatty Library in Dublin), which is incomplete in its present state. It is difficult to link the picture with a particular tale, because it lacks specific identifying details. The nastaliq passage below the painting, from the story of three farmer brothers (the forty-ninth night in the series), has been transposed and does not relate to the image. Likewise, the illuminated heading, a later addition, does not belong to the manuscript. In its simple, symmetrical composition and restrained movement, this work reflects the influence of the great painters of the Persian Safavid court. It is Indian in mood and feeling, however, recalling northern pre-Mughal painting in its warmer palette, larger figures, and true profile of the facial contours. Akbar's interest in the visual world is evident in the shading that gives greater realism to the hard outline of the figures.